While gold continues to struggle to find a catalyst, the price of silver made a notable move this week. Silver prices are up almost 2% in the past week and nearly 3% in the last two weeks. And that's despite the dollar index being up over 100 basis points, or nearly 1%. The most logical explanation is that weak hands are mostly done selling and bargain hunters have decided to step in. While the gold-to-silver ratio best shows silver's quick gain relative to gold, silver stocks have not kept up with the metal itself. Silver spent most of the last week in further consolidation mode, faced with the headwind that was the Fed rate hike. That took the U.S. dollar higher on Thursday. From there it kept gaining, rising from about 94.3 all the way to 95.3. Silver took a hit on Wednesday once the rate hike was official, then sank further on Thursday as the greenback gained. Thursday's move lower was on the back of the euro falling. 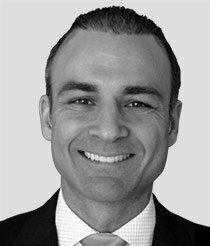 That pushed the DXY higher as concern over a possible delay for Italy's budget proposal weighed on the currency. 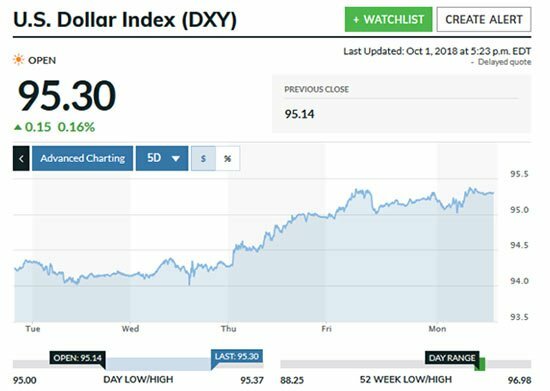 The dollar soared, taking the DXY to 95.3 by mid-morning, a 130-basis-point gain from Tuesday's low. 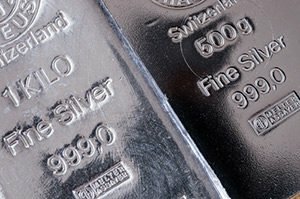 Silver was beaten down on Thursday in the wake of euro weakness and a somewhat hawkish outlook from the Fed that rate hikes would continue into 2020. But the most impressive move for silver came on Friday. Silver prices rallied strongly throughout the New York trading day, running up from about $14.28 to end at $14.64, producing a stellar 2.5% in just that trading session.